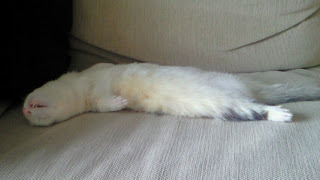 Lucky (my Ferret) looking so adorable! After more than 1 week at my office I finally got back to my soft bed at home. By morning my back was out so I had the chiro look at it, he said the shock of sleeping and on a nice bed may have done it. He said Kendo was off limits, a friend had organised tickets to see FC Tolyo vs Yokohama Marinos. I hobbled on over to Yokohama stadium and relaxed. That was probably what I needed most. Sunday spent the day organising this weeks events. You might know I use google Apps for my company. Mainly for the simple reason Gmail is pretty good at catching spam, you can just leave the spam in the box and it will delete them after 30 days. AAAAnyway for a couple of years now my spam box is usually filled with about 3000 spammies, thats approximately 100 a day! 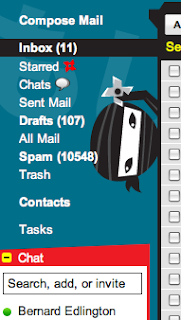 The last few weeks I have found my spam box crossing the 10000 mark! Geez someone is really trying to sell me some blue pills hey. A sign that even the spammers are trying harder in these economic rough times to make a buck? Spent a wet Tuesday camping up in Douji, my Golden week was short but it's always good to get out of Tokyo even if it is for a short time. At least the rain kept the crowds off the roads, so the return trip this morning was speedy. I am looking for some help with this years Siggraph Asia which will be held in Yokohama this year. I am on this years Siggraph Asia courses committee that means I will be asked to judge some courses soon. So I am looking for at least 5 people willing to volunteer a little time to help me critique the courses. 1. You are involved in the computer graphics or interactive techniques field, you can be studying, teaching or working. 2. 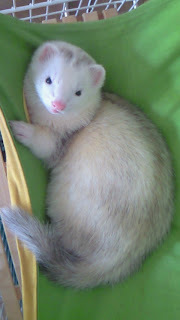 Competent at reading English only, writing and conversation is not required as you can respond to me in Japanese. 3. Give up a few hours to read the courses and write a small paragraph on what you think. Some of the courses are hard and some are basic so I will need people from different levels. 2. read a bunch of courses and see what ones make it and what do not. This is great if you want to eventually write a course for Siggraph in the future. 3. A written letter of recommendation from me on your abilities to judge. You can do this from your home or you can come around to my office. I am also volunteering my time so I do understand the sacrifice it takes. Danced at club Soft in Shibuya till the wee hours of the morning. Sony CSL researcher and fellow Siggraph Asia committee member Ivan was showing his skills on the turntables. Ivan was playing with fellow Minimal Tokyo member Tatsuya and special guest Elbee. Soft also had a great "vanity" mirror in the toilet explaining how goodlooking the viewer is. I gotta get me a feelgood device like that. Spent the evening at CGM night, so much fun to attend someone ELSEs event for a change. That was a good excuse to get whacked! Fellow Siggraph Asia committee member Ivan was there and had a long chat with his mates. There were some good photographers there so I didnt even try to take some decent pics. BTW the best pics of the night I think were by Derek Arnwine here. I also bought a poken which Andrew Shuttleworth rightly flogged to me. Now I have a new toy I am gonna have to pull apart!